Winner of the Prix du Public at Les Rencontres du Cinéma Italien at Toulouse, “Harlequin” is an engrossing, entertainingly charming new Italian film about rediscovering what’s important in life. Matinee idol Paolo Milesi has it all: looks, women, money, his own popular daytime TV show. But his perfect world begins to crumble when his aging, estranged father — like Paolo, an actor, though with a classical theater troupe rather than a TV network — is reported to be in critical health. 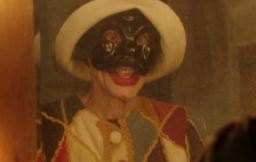 Paolo rushes to his home town only to find the old actor stubbornly rehearsing to perform his beloved Commedia dell’Arte character Harlequin, a soulful, miming clown, one last time. As the old wounds of their difficult relationship are reopened, the magical world of Commedia dell’Arte begins to seduce Paolo, and make him question his own superficial existence.